For well over a year now I have been working on presenting the Eve Chronicle Ruthless. At over a hundred pages and spanning somewhere around two and a half hours of audio once completed, this particular Chronicle is the longest and most ambitious project ever undertaken on this podcast. Completing the Eve novella “Ruthless”, today’s episode is the final chapter of this six-part epic story. In this chapter Ralirashi engages in a boardroom showdown to expose the evil behind the Ishukone Corporation. Meanwhile Otro, flying Ishukone’s experimental battleship, must convince enemies to work together to take down the deranged Admiral Bane. No battle is certain and no conflict is without cost… and there are ruthless choices to be made along the way. For those who have been involved in the project, I thank you very much for your time and your talent in making this production a reality. There have been roadblocks and unexpected twists along the way, and this episode (indeed, the entire publication of this Chronicle) stands as a testament to your patience and your willingness to help. Here is a link to Ruthless, Chapter 6 aka Episode 64. Please note that this is the sixth part of this story – the earlier episodes are also available for download on this site. I intend to make a longer version of the entire Ruthless story (six chapters in one file) in the near future. This will include commentary about some of the pitfalls and unexpected delights experienced along the way as well as an insight to the production process. I also plan to put in a “blooper reel” – with hours and hours of recorded audio on the cutting room floor there are several moments that made us all stop and have a good laugh along the way. Continuing with the Eve novella “Ruthless”, today’s episode is the fifth chapter of six. In this chapter Otro, Mila and Gavriel have been located by the vicious Admiral Bane of the Guristas. Even at their darkest hour, when all hope seems lost, Otro has a plan… but he’ll need help from an unusual source to rescue the others and bring Bane to justice. Here is a link to Ruthless, Chapter 5 aka Episode 63. Today’s episode is a recording of the Pod and Planet 2017 competition’s winning entry, Flametender. This is the story of Minmatar capsuleer, an immortal warrior for the Brutor Tribe, and the debt he owes to his blood brother. Thank you Djavak Andrard for writing such a great story and thank you Telegram Sam for holding the fiction contest again this year. It has been my pleasure to record this episode. Here is a link to Episode 62. Continuing with the Eve novella “Ruthless”, today’s episode is the fourth chapter of six. In this chapter the dark truth behind the success of the Ishukone Corporation is uncovered as the Guristas are closing in on their hunt for Otro and Gavriel. Here is a link to Ruthless, Chapter 4 aka Episode 61. Continuing with the Eve novella “Ruthless”, today’s episode is the third chapter of six. In this chapter we our three main characters come to terms with their past and the paths that led them to where they are and what they have become in life. There are no saints in New Eden. Here is a link to Ruthless, Chapter 3 aka Episode 60. Continuing with the Eve novella “Ruthless”, today’s episode is the second chapter of six. In this chapter we continue the story of Otro and Gavriel, now pirates preying upon the Ishukone Corporation. We are also introduced to Mila and Ralirashi, two very different people at the beginning of their battle against a mutual and as-yet unnamed foe. The next chapter (and subsequent chapters) will be released as editing and post-production are complete. Here is a link to Ruthless, Chapter 2 aka Episode 59. A story this large needs to be presented in multiple parts. Today’s episode is the first chapter of six, the story of the humble origins of one of the most notorious outlaws ever known to the Caldari State. The next chapter (and subsequent chapters) will be released as editing and post-production are complete. For those who have been involved in the project, I thank you very much for your time and your talent in making this production a reality. There have been roadblocks and unexpected twists along the way, and this episode stands as a testament to your patience and your willingness to help. Here is a link to Ruthless, Chapter 1 aka Episode 58. Today’s Chronicle is perhaps the most famous of all of Eve’s backstories – the story of first contact between the Caldari State and the Jovian Directorate as well as the story of the first capsuleer. If a list ever existed consisting of the top five essential stories for understanding the lore of Eve, this chronicle would be on that list and probably at the very top of that list. This Chronicle is such a prominent fixture of the lore that I used it for my trial episode, aka “Episode 0” when I first envisioned the Eve Reader podcast nearly four and a half years ago. So much has changed! In that time I have upgraded my microphone from a USB web camera microphone (which was already four years old when I started in 2013!) to a studio-quality Shure SM7B microphone. I also polished my editing and production techniques in order to create a cleaner sound with better production values. While I was pleased with the overall result when “Episode 0” was released back at the beginning of 2013, it always nagged at the back of my mind. After all, I used one of the best introductions to the lore and turned it into an experimental prototype for the podcast. What if people listed to it and stopped there, with its rather scratchy audio and too-long intro and extro sections? Wouldn’t it be nice to take such an important story and re-do it in a more modern format? Thus the idea for redoing this Chronicle was born. 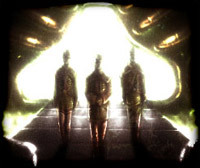 For those of you who have heard this story before, I encourage you to share the link to this file with those who have never heard the lore before – and if you have never read or heard of the Jovian Wet Grave, then turn down the lights, turn up the volume and listen to the joy and terror of the first ever capsuleer in Eve. Here is a link to Episode 57. With the recent interest in the events surrounding the Kyonoke Pit (and at the request of a long time fan) I have recorded the chronicle Kyonoke Pit. This chronicle tells the story of the events surrounding the biological plague at the Kyonoke Pit installation. This Chronicle is actually one of the oldest ones published by CCP. In fact, it has now replaced The Prophecies of Macaper as the oldest Chronicle I have recorded. The story does give a tantalizing story lead from so long ago, and here we are fourteen years after the Chronicle was published, following up on these events. I for one am interested in seeing where CCP goes with this potential story in the modern game! Here is a link to Episode 56. Today’s episode is a recording of the Pod and Planet 2016 competition’s winning entry, Escape. This is the story of a capsuleer struggling with his internal demons… but not all demons are within. Thank you Breeze One for writing such a great story and thank you Telegram Sam for holding the fiction contest again this year. It has been my pleasure to record this episode and I look forward to recording the winning entry for the 2017 contest! Oh, and Lenore the Podcast Kitty insisted that I record a bonus track as well, so stick around past the end of Escape for an extra Chronicle. Happy Holidays! Here is a link to Episode 55. Here is a link to Episode 54. Today’s Chronicle gives us an insight into the mind of Tibus Heth, the man who rose to power as the de facto ruler of the Caldari State. Even the most powerful man in the State can find himself ultimately a victim of the very corruption he sought to fight. Here is a link to Episode 53. The Caldari State is managed, maintained and virtually ruled by its corporations. The eight largest Caldari corporations each have a military arm, known as the corporate police, to enforce their rule. Today’s Chronicle is about the history of these police forces – how they came to be, what they do for the State and what makes them different from one other. Here is a link to Episode 52. Today’s episode is the story of a rebellion by the Minmatar tribe known as the Starkmanir, and the Amarr reaction to this rebellion. This incident is significant as a leading up point toward the larger Rebellion that resulted in the Minmatars winning their freedom from the Amarr. Here is a link to Episode 51. This episode is the story of a man with an unusual affinity for fixing machines and the torment he endures in return for his “gift.” Science-fiction settings tend to hand-wave unusual or mystic abilities as “psionics” or “abilities of the mind” but I found this story fascinating by directly addressing the question of what-lies-beyond. Here is a link to Episode 49. Eye for an Eye was a fun little episode to record and gave me the chance to practice using sound effects recorded directly from the game. This was something that I did in a smaller way in earlier stories and would like to continue to do in the future. As for the story itself, this is one of the older chronicles but it has fared relatively well – this is a scene that could still be played out even today. Betrayal, loss of corporate power, finding new allies to aid in the struggle versus old allies… yes, this could be happening in New Eden even as we speak. The other story – “Speaks and Walks” – is a story of a DUST mercenary and the horrific side effects of the original technology that granted him immortality. I found this story particularly fascinating due to the parallels that can be drawn from the soldier’s conflict. Substitute in the stress of dealing with horrifying real-world events and you could have a model of someone struggling with the long-term effects of post traumatic stress disorder. Closer to our New Eden existence, substitute a cause in question – the why in Why We Fight, the who in Who We Fight For – and you have the root of every organized player conflict from faction warfare to nullsec sovereignty. There is always a risk of reading too much into a story, but having been in a position to relate to both of the scenarios above, this a story that called to me. Here is a link to Episode 48. This episode is CCP Delegate Zero’s intense lore Chronicle, Inheritance. This is easily the longest Chronicle I have recorded – at just over fifty minutes, it is nearly twice as long as any other project I have tackled in the past. I appreciate your patience while this Chronicle was recorded and edited, and I hope that you will enjoy the episode. Stay tuned at the end of the recording for discussions with Cyrillian Voth and Lenore the Podcast Kitty regarding the fall of the Jove Empire! Here is a link to Episode 46. Would you like to take part in the next recording? The next chronicle for release is “Inheritance”, the lore bombshell recently given to us by CCP. This fascinating story involves the Jovians, the Talocan, Caroline’s Star and even the newly-formed Upwell Consortium, answering long-standing lore questions even as it raises new ones for us to ponder. This chronicle simply calls out for multiple voices. The talented Cyrillian Voth and Elinari Rhodan (from Episode 44, A Spider in her Web) return to voice two of the characters, and this time they are joined by Random McNally from The High Drag Podcast. However… I am still one voice short, for the part of Devan Malate, the Gallente representative to the Inner Circle of CONCORD. Therefore I would like to open up this opportunity to the community at large. This part does not have a vocal definition so it can be someone who is young, old, male, female, with or without an accent… there is a lot of leeway in the recording. The character is a factional representative to one of the most powerful institutions in New Eden, so bear that in mind in delivering the line. With a one-line part like this, we don’t need to do anything as formal as multi-track recording on a Mumble server. Simply record the line on your computer, save it as an MP3 file and email it to me. If you need a program to record a file as an MP3 then start with this Google search for a program that will suit your operating system. 1. Start the recording with your name. I don’t want to mispronounce your name, so if I hear you say it then I know how to pronounce it in the credits. 2. Ideally, record several takes so the one that flows the best can go into the recording. 3. Please leave about five seconds of “dead air” at the end of the recording. This gives me background noise for my noise-filtering software and aids in post-production sound clean-up. Once you have your recording, please email it to zendane [at] evereader [dot] org as a file attachment. If you would prefer to use an alternate method (such as Soundcloud) for storing your recording then simply email me a link to it. Finally, I need to say that by sending a recording (or link to a recording) to me for this project, you are giving me permission to use it in the eventual recording. Naturally I give credit where credit is due – there’s a page at the very top, for the curious – and your name will be listed in the credits. My goal is to have this episode released soon, so I will accept sound files until February 11, 2016 at 20:00 Eve time. Thank you for reading this post and I look forward to (literally) hearing from you! Today’s episode is the story of a scientist, his research and his unusual methods in conducting his study of the “Extinction Burst” concept. This is not an episode for the faint of heart! Be sure to stay for the very end of the episode for an explanation on why there are occasional delays between recordings! Here is a link to Episode 45. Today’s episode is a recording of the Pod and Planet 2015 competition’s winning entry, A Spider in her Web. This is the story of a man on the run from a group that he betrayed… and the very special means used by that group in their hunt for him. Thank you Voodoo Williams for writing such a great story and thank you Telegram Sam for holding the fiction contest again this year. It has been my pleasure to record this episode. Here is a link to Episode 44. Today’s Chronicle is the story of a young man with a particular talent for hacking high security systems… and a pair of shadowy men who wish to acquire his services. Here is a link to Episode 42. Shot down deep behind enemy lines just short of their assigned objective, a Caldari covert operations team races against time to complete their mission. This Chronicle is just as much about their struggle as it is about the indomitable spirit of the Caldari military. Here is a link to Episode 41. Incursions – the defense of New Eden systems versus Sansha’s Nation – are an integral part of the game. But what does one look like? What would it feel like to be one of the helpless millions on the planet below, watching the terrifying force of the marauding Sansha invade their system… and the even more terrifying prospect of having the capsuleers “save” them? Here is a link to Episode 40. Thank you Kirith Kodachi for writing such a great story and thank you Telegram Sam for holding the fiction contest again this year. It has been my pleasure to record this episode. Here is a link to Episode 38. In the lore of New Eden, both the Amarr Empire and the Gallente Federation share an uncomfortable commonality – at one point in their histories, they were betrayed by a member of their leadership. Both the corrupt former Chamberlain of the Amarr and the former Grand Admiral of the Federation became hunted men within known space, evading those they betrayed… for a time. Eventually, each was caught and brought to justice. This chronicle tells the story of their ultimate fate. Here is a link to Episode 37. Last night I attended the Eve Lore Panel hosted by the folks at Hydrostatic Podcast. I was impressed by both the quality and the depth of lore analysis by panelists, and several times the “Prophecies of Macaper” were mentioned in connection to recent and upcoming events. Inspired by the enthusiasm of the panelists and the panel audience, I decided to record this Chronicle today. Here is a link to Episode 36. This Chronicle tells the story of a man, the Sisters of Eve, artifacts of great power… and pamphlets. Here is a link to Episode 35. This Chronicle is the second part of A Beautiful Face, continuing the story of a woman’s vanity and the punishment methods of the major empires. Here is a link to Episode 34. Aura, the ethereal voice of Eve’s starship interface, is a familiar voice to every pilot in New Eden. But who is she? Today’s episode tells the story of Excena Foer, best known to pilots as Aura, and how she came to be the omnipresent voice of our starships. Today’s episode involves a mining station under attack by marauding pirates and one man’s fight against them. Without giving away too much, if you enjoyed the last episode’s use of an “ordinary” man and his involvement with the power of the capsuleers, you’ll find something similar in this episode. In this episode, an injured starship crewman receives a visit from a capsuleer looking for answers about the crash that “killed” his immortal captain. Here is a link to Episode 29. Today’s episode is about the young son of a powerful Amarrian noble, who slips past his protectors in the spirit of youthful adventure. Here is a link to Episode 28. This episode – Intercession – is a recording of the grand prize winner of the Pod and Planet 2013 competition. This story defies a simple one-sentence explanation, so I’ll simply say that it is the story of two brothers, their life within wormhole space, and a mysterious force that wormhole dwellers will recognize… and fear with good reason. This particular episode took some extra time to record and now hold first place as the largest episode I have recorded, requiring considerable post-production. I also used the voices of several others in this recording (thanks guys!) which presented its own challenges and enjoyment. Thank you Rhavas for writing such a great story and thank you Telegram Sam for holding the fiction contest. It has been my pleasure to record this episode. Here is a link to Episode 27. Today’s episode is the story of the assassination of a high ranking Caldari official and his final thoughts… from his perspective. Here is a link to Episode 26. Imagine you are a broken creation, in search of repair and renewal. Add in the insanity of the rogue drones and you have today’s Chronicle, Postnatal. Here is a link to Episode 25. This is an episode with two Chronicles, both about the enigmatic entity known as The Broker. Myth of a Salesman gives us background on this mysterious person, and Big Fish, Little Fish lets us see him in action. Here is a link to Episode 24. With the upcoming Rubicon patch is a new Chronicle about a scientist working within a secret laboratory, perhaps at one of the newly introduced Ghost sites. Here is a link to Episode 23. After the terrible punishment Aritcio Kor-Azor endured in the prior episode “The Speaker of Truths” he is a new man with a new mission in life. This is the story about how he deals with those who would rule as he once did. Here is a link to Episode 22. This Chronicle is the story of the uprising against the cruel Heir Aritcio Kor-Azor, and the punishment in response to his sadistic rule. Here is a link to Episode 21. In this episode we see how the Caldari treat the Gallente on occupied Caldari Prime, and how one Gallente fights back against the invaders. Here is a link to Episode 19. This episode is about a man living on occupied Caldari Prime, under the shadow of the Titan. Here is a link to Episode 18. By request, I’ve recorded the Silent Furies chronicle, a story giving insight into the Minmatar leadership. This story is part of a larger story arc that also involves the Eve novels. Here is a link to Episode 17. Quite a contrast in style to the previous episode, this Chronicle is about a mythical force that watches over two of the Caldari races. Here is a link to Episode 16. This episode was a special request that was quite a lot of fun to record! Episode 15 talks about the Scepter and the Crown, two holy relics of the Amarr Empire. Here is a link to Episode 15. I have uploaded Episode 14 to the website. This story involves the inhumanity of the Sansha versus the humanity of a man fighting against them. Here is a link to Episode 14. The fourth episode of the Methods of Torture series is now available, featuring the Gallente. Please note that due to graphic content, this podcast is for mature audiences only. Here is a link to Episode 13. The next four episodes will be from the “Methods of Torture” series, by request. There is one Chronicle per race and the first story is about the Amarr. Here is a link to Episode 10. Here is a link to Episode 9. Here is a link to Episode 8. Here is a link to Episode 7. I have uploaded Episode 0, The Jovian Wet Grave. I would appreciate your comments and feedback! Here is a link to Episode 0.